About knee and leg problems? Knee problems are quite common because the knee has a similar level of forces through it as the ankle or the hip, but the bony joint of the knee is not as stable as either the ‘mortice and tenon’ type joint at the ankle, or the ‘ball and socket’ joint of the hip. The knee is essentially one bone (the femur) stacked lengthwise on top of another (the tibia) and held together by powerful muscles and strong ligaments, there are also two cups made of cartilage, these help to pack out the joint and make a closer fit between those bones. The knee is designed to move primarily in one plane, unlike the hip which can move in many, that is to say it flexes ie bends in a backwards motion from neutral, there is a tiny bit of extension (forwards motion) and a little bit of rotation to help it lock when you are standing but it pretty much operates in one direction only. This means that the knee struggles to compensate when there is a problem at the hip or the ankle which changes the relationship between the two bones, in these cases a primary problem in the hip or ankle may cause a secondary problem in the knee or in the muscles of the leg supporting the knee. Another structure that can cause both leg and back problems is the pelvis and my postural assessment will look to see if there is a pelvic torsion and whether that can be resolved or is part of your fixed architecture and needs to be accommodated. As an osteopath I will look at your posture and the way you use your limb to identify which structures are causing your pain or poor function and also the way other structures contribute to that. I will then work with you to create a treatment plan in order to help restore healthy function as much as possible and/or prevent further deterioration. Listed below are some common knee and leg conditions and some approaches to osteopathic treatment. I’m not going to pretend that there is some magic trick to instantly repair a muscle tear but often there is an associated joint problem or imbalance which lead to poor or inappropriate force dissipation and caused or contributed to the tear. If so, resolving that may help the tear to heal more quickly and, of course help prevent it happening again. Very similar to muscle tears these are often aggravated by joint problems in the foot, ankle and lower leg, if so osteopathic treatment may aid recovery and prevent recurrence. The Iliotibial band is a thickening of the fascia (In this case it is a membrane that wraps around your thigh like a compression stocking ) the largest buttock muscle ‘gluteus maximus’, and another smaller muscle, ‘tensor fascia late’ both attach to it so you can think of it as a long flat tendon for those muscles. It performs a number of roles, it stabilises the outside of the knee, it helps dissipate forces from the foot upwards and it pretensions the fascia around the quadriceps muscles helping them to explode from a squatting position. The position of the iliotibial band relative to bony aspects of the knee and hip changes as we walk. As it passes over these bony outcrops it can cause friction, which in turn can cause inflammation and pain, particularly in runners. 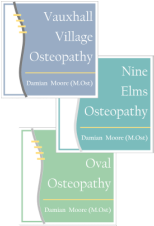 Research into this area is ongoing but it appears that there are multiple reasons why this may occur and some of these are amenable to osteopathic treatment. I can assess your posture and identify likely causes, treat those appropriate and advise or refer where an alternative approach is required. The knee is a common site for osteoarthritis. This painful condition occurs when excessive cartilage wear, often as the result of a previous unresolved condition causes inflammation and bony changes. I can analyse our posture and gait to see if other joints of imbalances are leading to increased wear on the affected area of the joint and act to resolve or improve those. I can also help protect the joint by articulating it to gently maintain range of motion and to ensure that the nourishing and lubricating synovial fluid reaches all parts of the joint surface with the aim of preventing further deterioration. This is damage to cruciate or collaterol ligaments or to the cartilage meniscae - Once again I have no magic wand for these but can help to ensure that the knee functions without additional stresses so that it can heal as well as possible. Many people function without one or more of the ligaments of the knee as the muscles are often able to provide the support required instead. Bear in mind that those muscles will be working harder than usual and therefore it is even more important to ensure that further postural imbalances are reduced to a minimum. A fold (or plica) in the joint capsule of the knee can sometimes get trapped between the femur and tibia or under the kneecap and just like when you bite your cheek it becomes inflamed and thickened and then may repeatedly get trapped. Sometimes it is a tiny piece of debris that can get caught instead, this is called a mouse. Both of these can cause discomfort, and prevent the full use of the knee joint. In some cases surgery is required to remove the debris or the thickened tissue but in some cases articulation of the joint can allow gravity to dislodge a mouse into an area where it causes no pain or dysfunction and will be gradually absorbed and sometimes removal of a joint or muscular imbalance problem elsewhere will allow gait to normalise and stop the plica being caught and irritated. There are other conditions which can cause pain in the leg and knee including infections and circulatory problems. If there is good reason to believe that your problem does not have a musculo-skeletal mechanical cause I will always refer you as necessary.